Why Take A Peralta Hacienda School Field Trip? School Field Trips at Peralta Hacienda Historical Park are intended to offer experiences too big for the classroom. Every element of our Field Trips tie into social studies curriculum and use hands-on activities to excite curiosity in students. 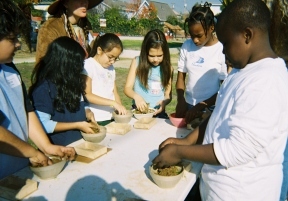 Field Trips at Peralta Hacienda receive consistently stellar reviews from Bay Area teachers. Peralta Hacienda offers two highly acclaimed Hands-on History Trips. Ohlone Daily Life focuses on the first peoples of Northern California, while Peralta Rancho Life immerses students in the later Mission and Rancho periods. The tours are focused on 3rd and 4th grade curriculums, respectively, but students from 3rd grade to middle school can enjoy either. Come for one, and you'll want to come back for the other! Click here to sign up for a Field Trip. The cost of participation is $15/student. Schools unable to pay full price may pay on a sliding scale starting at $10/student. Adult chaperones are free. The minimum size for a visit is 25 students (or a minimum charge of $300 per group). Please note that the Peralta Hacienda Field Trip program relies on a majority of schools paying the $15 price in order to continue. CLICK HERE TO FILL OUT AN EVALUATION! We need your feedback in order to continue affordable rates for our school field trips.